Austria Solar teamed up with design group ServicePlan to create a beautiful and uniquely apt presentation of their annual report – it’s printed with special ink that only materializes when exposed to the sun! The elegantly designed document is shipped out in light-proof foil, and each page remains blank until exposure to sunlight reveals its contents. This mature play on childhood invisible ink games serves as a gorgeous example of how to make bureaucratic paper-work striking and original, if still not particularly eco-friendly. 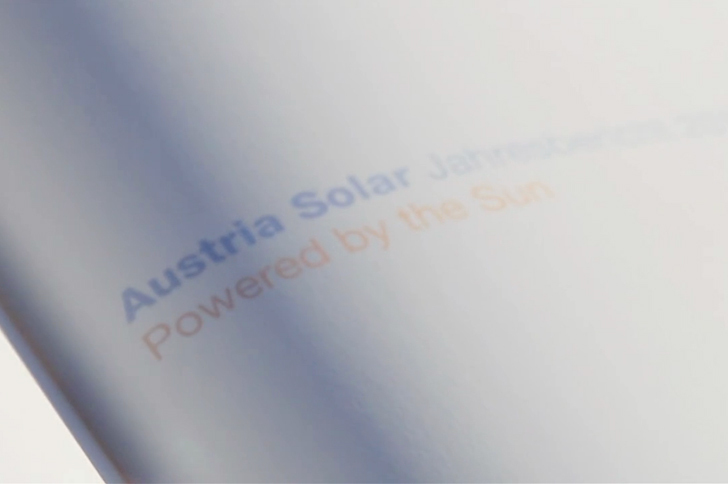 Austria Solar teamed up with design group ServicePlan to create a beautiful and uniquely apt presentation of their annual report - it's printed with special ink that only materializes when exposed to the sun! The elegantly designed document is shipped out in light-proof foil, and each page remains blank until exposure to sunlight reveals its contents. This mature play on childhood invisible ink games serves as a gorgeous example of how to make bureaucratic paper-work striking and original, if still not particularly eco-friendly.